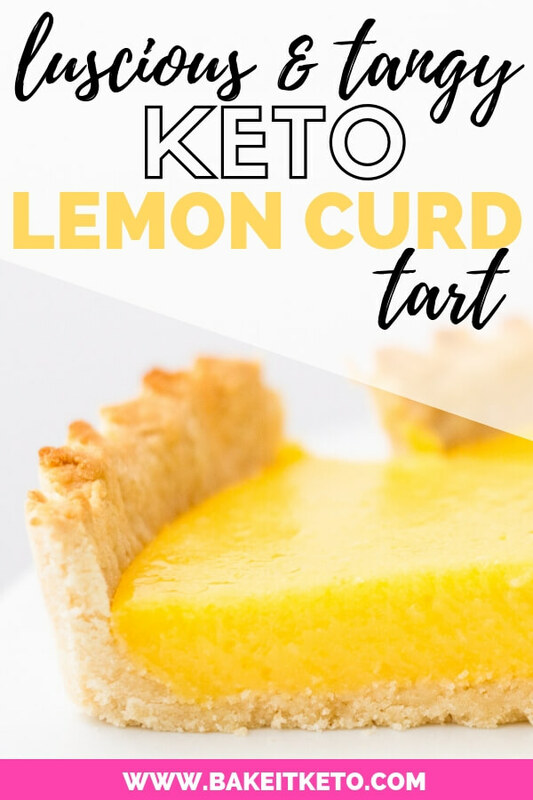 This keto lemon curd tart recipe pairs luscious, tangy sugar-free lemon curd with a rich low carb shortbread crust. No one will ever guess this is a healthy lemon tart! 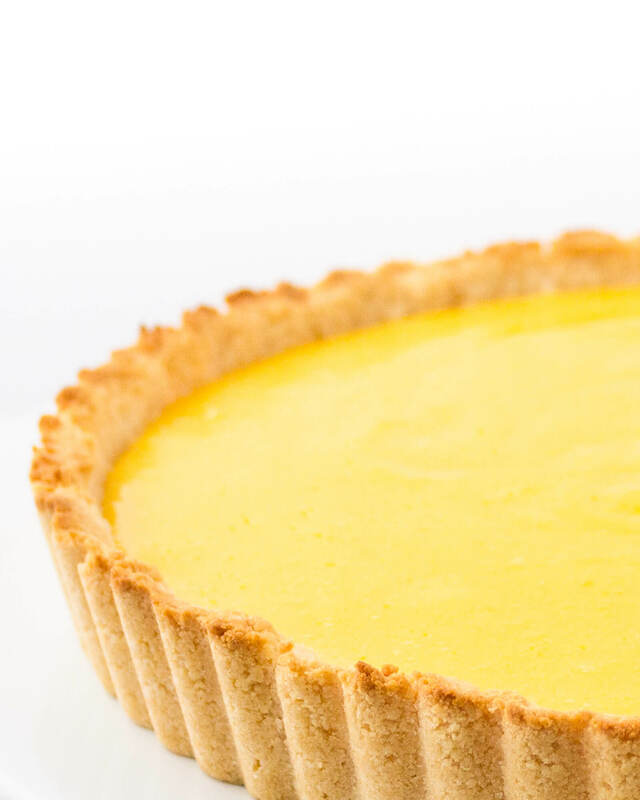 Let’s get one thing out of the way: this low carb lemon tart is so, SO good. I’ve talked about my love of lemon before (have you made my low carb lemon bars yet? ), so you know I’ve got unreasonably high lemon dessert standards. And this recipe won’t disappoint! For this recipe, you’ll need a 9-inch tart pan. When buying a tart pan, look for a non-stick pan with a removable bottom. 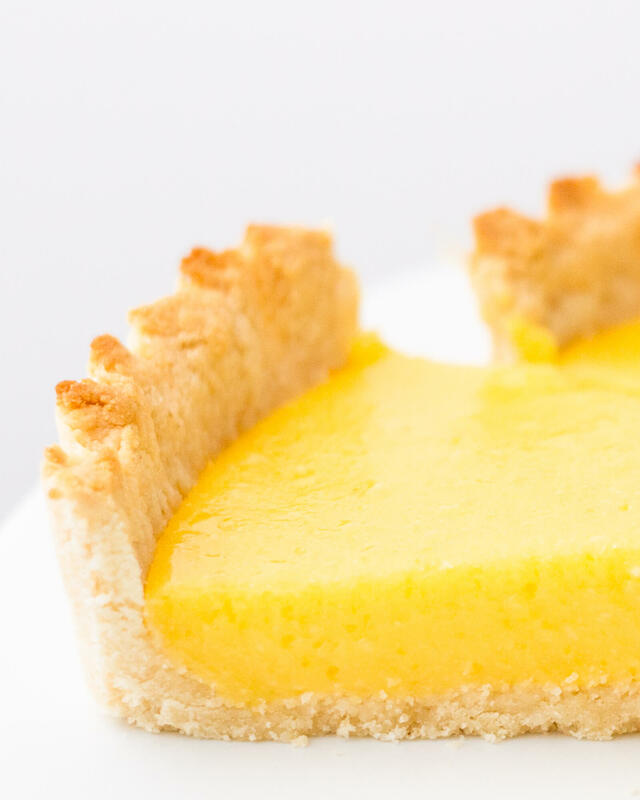 Unlike a straight-sided pie crust, tarts traditionally have fluted sides, and the removable bottom makes it easy to pop out a gorgeous looking tart. A good quality pan should feel heavy for its size. I use and recommend Wilton Excelle Elite tart pans or Wilton Perfect Results tart pans. I’ve found a noticeable difference in quality when comparing these to less expensive tart pans. 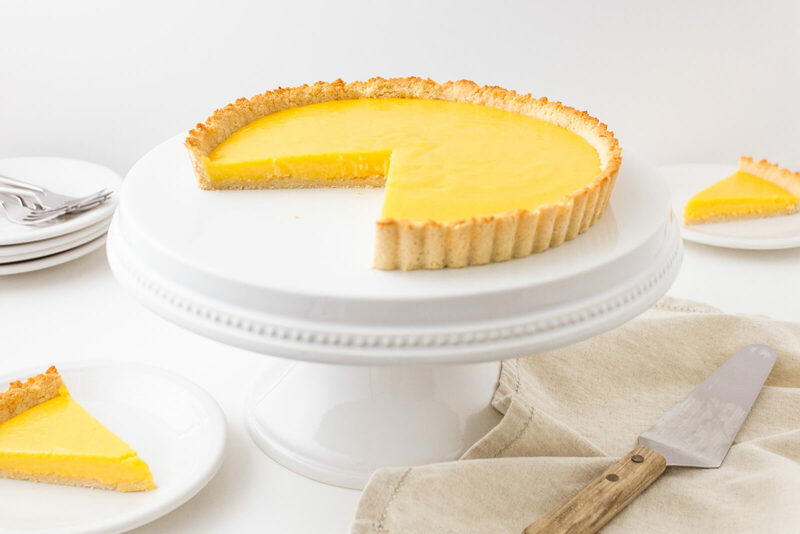 It’s very easy to make this sugar free lemon tart into a dairy-free tart! 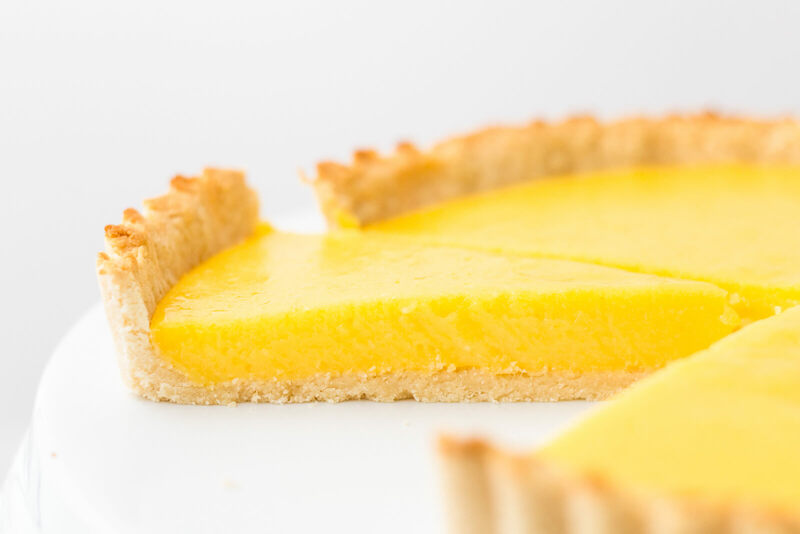 Simply substitute coconut oil in place of the butter in both the lemon curd and the keto tart crust. What’s the best sweetener to use for low carb lemon curd? I recommend using Hoosier Hill Farm allulose to sweeten your keto lemon curd tart. I love allulose because it tastes more like real sugar than any other keto-friendly sweetener I’ve tried. What is allulose? It’s is a naturally occurring non-caloric sweetener called a rare sugar. And since it’s hardly fermented in the gut, it may be a good choice for those that experience digestive upset from erythritol. Can you make keto lemon curd with Swerve? If you already have Swerve in your cupboard, you can absolutely use that in place of allulose. Swerve is sweeter than allulose, however. So I would recommend only using 3 tablespoons of Swerve in the keto shortbread crust and ¾ Cup of Swerve in the sugar-free lemon curd. This recipe is so incredibly quick, easy, and forgiving. Don’t let using a double boiler scare you! Plus I have a secret foolproof step to get your keto lemon curd silky smooth (more on that below!). Secret #1: Whisk the lemon curd mixture immediately after adding your eggs to the allulose and lemon juice. Both the lemon juice and allulose will start chemically cooking your eggs (denaturing the proteins) when they come into contact. If you don’t whisk them together right away, you’ll end up with lots of teeny tiny eggy lumps. Secret #2: Strain the curd as soon as it’s finished cooking, but before adding the butter. Straining your lemon curd immediately after cooking is the secret extra step that makes super smooth keto lemon curd easy and foolproof. Once your curd is fully cooked, it will be the same texture as sour cream or full-fat yogurt. In other words, it’s going to be thick! But once you add the butter it will cool down significantly and become even thicker. So make sure you strain first, and then add the butter! Don’t be tempted to skip straining. It only takes a minute and it’s really worth the effort! To strain the curd like a true pastry chef, tap the edge of the strainer firmly against your palm until most of the curd has passed through. Then use a rubber spatula to gently help the rest through without damaging your strainer. Traditional shortbread is made with just butter, sugar, and flour — no eggs! But with no gluten protein to add structure, dough made with coconut flour isn’t very sturdy. I’ve found that adding an egg white to coconut flour shortbread dough makes it much more forgiving. And it still has that rich, buttery shortbread flavor. What is the difference between lemon curd, lemon butter, and lemon cheese? These days, lemon curd, lemon butter, and lemon cheese are all just names for the same thing. Sure, regional differences have given us many names for the same dessert, but the end result is more likely to vary recipe to recipe than country to country. The Cookbook of Unknown Ladies is generally accepted to be the earliest mention of lemon cheese. In this recipe, lemon juice separates cream into curds and whey. The resulting cheese is sweetened to taste and then strained using cloth. The book is kept in the Westminster City Archives, and they chronicled their adventures with The Cookbook of Unknown Ladies in a fascinating series called “Cooking Up History”. You can see an image of the original lemon cheese recipe on their blog. In a later cookbook from 1844, called The Lady’s Own Cookery Book, the same process is used to produce a recipe called lemon curd. But how we went from these historical versions to the lemon curd we know today seems to be anybody’s guess! Drizzle your sugar-free lemon curd over a stack of low carb pancakes. Spoon low carb lemon curd over keto vanilla ice cream. Make an easy keto lemon curd trifle: layer lemon curd with homemade, sugar-free whipped cream and slices of low carb lemon or vanilla cake. Top a low carb vanilla cheesecake with lemon curd. 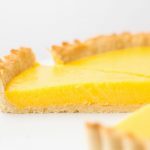 This keto lemon curd tart pairs luscious, tangy sugar-free lemon curd with a rich low carb shortbread crust. Gluten free, sugar free, with dairy free option, and made with coconut flour (no almond flour). No one will ever guess this is a healthy lemon tart! In the bowl of a food processor, combine the coconut flour, allulose, and salt. Add the butter to the food processor and pulse to combine, until it reaches a sandy consistency. Add the egg white and pulse to combine until the dough is fully hydrated and forms pea-sized pieces. Press the shortbread dough firmly into a 9-inch tart pan with a removable bottom, using the bottom of a glass or your fingers. Use a piece of plastic wrap to prevent sticking while pressing the dough in if necessary. Bake at 325 degrees F for 10-12 minutes, until the outer edges of the shortbread have just begun to brown (you still want it to be underdone at this stage). Leave the oven on. Prepare a mesh strainer by setting it over a medium heatproof bowl. Set the strainer and bowl aside near your stove. Fill a medium saucepan with 3-4 inches of water and bring it to a simmer over medium heat. While the water is heating, combine the allulose, lemon juice, and lemon zest in a large, heatproof bowl and whisk to combine. Add the eggs and egg yolks and immediately whisk to combine. Place the heatproof bowl over the simmering water to form a double boiler. Continue whisking the egg mixture constantly. The allulose will gradually dissolve and then the mixture will begin to thicken. The curd is done cooking when it has reached 160 degrees F and is the consistency of sour cream or full-fat yogurt. Turn off the burner and remove the bowl from the double boiler, being careful not to burn yourself on the escaping steam. Immediately strain the hot lemon curd through the prepared mesh strainer and into the bowl. Tap the strainer firmly against your hand, and use a rubber spatula to help the curd through without damaging your strainer. Add the butter, vanilla extract, and salt to the hot curd. Whisk the curd occasionally, until the butter has melted completely and is fully incorporated. Pour the curd into the parbaked low carb shortbread crust. Gently shake the pan to even out the curd or spread it with an offset spatula. Bake the tart at 325 degrees F for 15 minutes to set the curd filling. For best results, allow the tart to cool and then chill for 1-2 hours, or overnight. Store in the refrigerator. 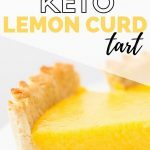 WANT TO SAVE THIS KETO LEMON CURD TART FOR LATER? CLICK HERE TO SAVE THIS RECIPE TO YOUR FAVORITE LOW CARB PINTEREST BOARD!